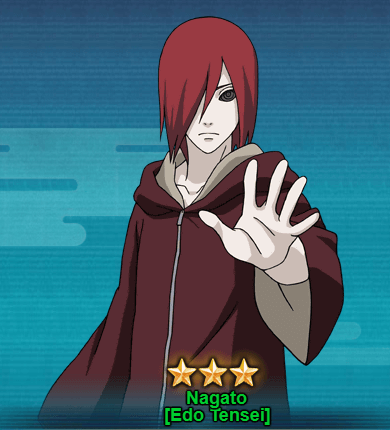 Nagato was a student of Jiraiya and hails from Village Hidden by Rain. He founded Akatsuki to bring peace to the shinobi world along with his friends, Konan and Yahiko. After the death of Yahiko, new Akatsuki was founded with the alliance of Tobi (Obito). During the Pain Invasion, Nagato end up giving up his life force to revive back all the ninjas killed during the invasion. He was reincarnated during the Fourth Shinobi World. Nagato was removed from the control of Kabuto when Itachi stabbed him with Susanoo;s Sword of Totsuka. Let’s take a look at Nagato [Edo Tensei] abilities. Taijutsu & Ninjutsu Almighty Push [Prompt]: Causes damage to the opponent’s entire team and 4 COMBO, a selected unit will suffer from Repulse. Moreover, will cancel all of the selected unit’s Shield and Buffs. This skill is immune to Interruption. Ninjutsu Soul Swallow: Attacks the opponent’s units in the front row and absorbs a maximum of 40 Chakra points, has a fixed chance of causing Knockdown and Chaos. Ninjutsu Hell’s Crunch: Triggered with at least 10 COMBO, attacks 4 of the opponent’s units. Taijutsu Wrist Fire Arrow: Chases and Attacks a Repulsed unit, causes Knockdown and Ignition. Can be triggered twice each round. Ninjutsu Sealing Jutsu – Absorption: Before the first action in a round, cancel all Debuffs on the Edo Tensei units in your Lineup. Moreover, during this round, Nagato will be immune to all debuffs.